Tempo and DaraSportsPT are teaming up! 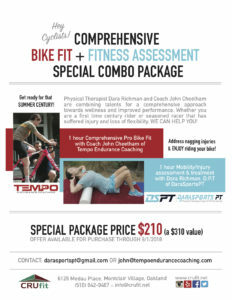 Get those injuries and bike fit issues dealt this summer! I’m really excited to put together this fantastic offer with Dara. We’ve worked together the last two seasons with the Oakland Composite squad, working hard to help rapidly growing kids fit on their bikes and stay injury free while doing it. Dara is a great talent both on the bike and treating injured athletes. It’s an excellent value and the offer ends soon, please contact Dara or myself to get your appointment booked.